Easy, breezy, and fun, BTS rapper Jung Hoseokâ€™s mixtape has finally dropped and itâ€™s everything we hoped for and more! After months of waiting, ARMY were finally treated with the release of rapper j-hopeâ€™s mixtape titled Hope World on March 1. Hope World was received with overwhelming enthusiasm by ARMY especially The Daily Voxâ€™s resident ARMY SHAAZIA EBRAHIM and FATIMA MOOSA. Mood when Hope World was released: Suga screaming j-hope. He teased fans saying that there is a hidden BTS member who appears in the video and that fans should try and figure who it is. This obviously left ARMY scrabbling to try and out who the member is. We think itâ€™s Jin but thatâ€™s just us. ðŸ‘‘ Jung Hoseok said there’s one member in his #Daydream MV. Hixtape wasted no time breaking records. It took the top spot on real-time iTunes album charts in countries like the United States, the United Kingdom, Canada, Brazil, Australia, for a total of 63 countries – the most ever for any Korean solo artist. The title track Day Dream is the number one on top song charts in seven countries: Finland, Romania, Slovenia, Ukraine, Armenia, Kazakhstan, and Vietnam.This was mere hours after its release! Itâ€™s 114 on South Africaâ€™s iTunes song charts. 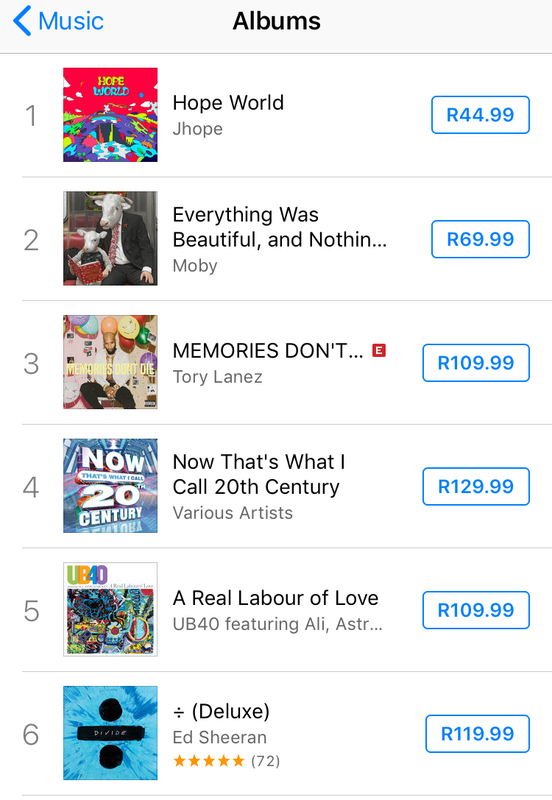 And South African ARMY showed Hobi all the love, Hope World is number one on iTunes here too. Hope World is a beautiful combination of bubbly and fun songs moving to more softer and deeper songs. Some of the fun songs on the album include the title track, Hope World and HangSang which features Supreme Boi, one of the producers for the group. Softer songs include P.O.P (Piece of Peace) and Airplane where Hobiâ€™s vocal ability is displayed in all its glory. Arguably the best singer in the rapline, Hobiâ€™s mixtape is a perfect balance of vocal and rapping. Fellow BTS member, Suga (Min Yoongi) who released his mixtape back in 2016 under the stage name Agust D joined in the solo accolades that the members are achieving. This once more proved that these boys produce quality no matter what they do. He entered Billboard charts for Emerging Artists at number 46 for the week of March 3 2016. The rest of the BTS members have all shown their support for j-hope posting congratulations and celebrations with the release of the album especially Jimin for is arguably BTSâ€™ biggest stan. í˜¸ë¹„í˜• ê·¸ë¦¼ìž ë¶„ì‹ ìˆ !!! Hobi also released the music video for Daydream on March 1 and it is a visual feast for the eyes. Its bold and bright colours allow viewers to escape to where dream meets reality. It delights the audience by giving us a glimpse of what it would be like to step into j-hopeâ€™s imagination with imagery of fish, sweeping landscapes, art, cartoons, rockets, outer space, and performing on stage. The video feels laid-back and breezy with j-hope just vibing to the beats in his signature edgy athleisure wardrobe. The YouTube video of his song got over 11 million views not even 24 hours after its release. Watch the full video below and be shook. J-hopeâ€™s mixtape is available to stream on Apple Music and Soundcloud and download on iTunes and Google Music. So happy to see articles about bts from south African sites â™¡â™¡ I still can’t belive it’s tied with LY:H for most no. 1s on iTunes and it was even no 1 on iTunes south Africa which is much higher than bts ranking, I hope through their next comeback more people here recognise them. ohhhhh, thank you for writing up an article about BTS and Jhope!!! Hobi took a big risk making this mixtape, and I’m so proud of him! He wasn’t trained as a rapper and this is just the beginning step of his personal career. He himself wants to learn and grow from this and I’m just so proud of himself for putting himself out there like this! Also, I’m so proud of my Armys famdom! You guys are the best and I’m so proud of being a part of this historic moment with you all! If anyone calls us the worst fandom ever or how we’re toxic, it’s because that’s the only thing they have left to say and it shows THEIR character, not ours. I know that Armys are Diamonds: strong, beautiful, hard af, and shining bright for our boys. PURPLE YOU SO HARD, ARMYS!!! Love you, BTS!!! Great job, Hobi!!! very nice articles ilove to read this.